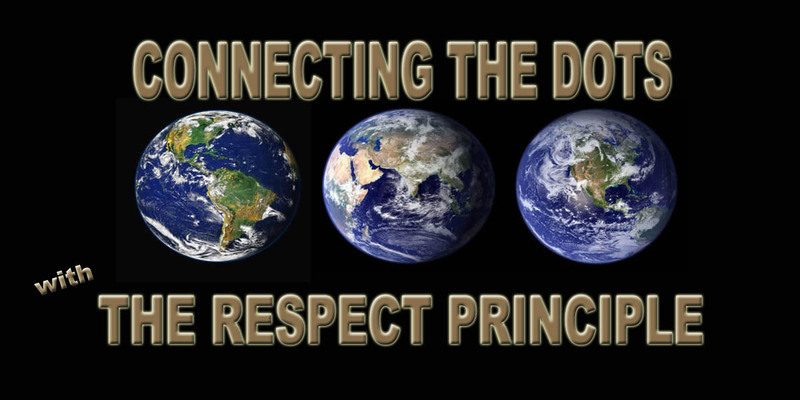 For several years, http://www.therespectprinciple.com was the domain name for my blog, Connecting The Dots With The Respect Principle; however last year began the transition from http://www.therespectprinciple.com to http://www.connectingthedotswiththerespectprinciple.com. As of today, http://www.therespectprinciple.com domain has been cancelled and all blog content is now only available at http://www.connectingthedotswiththerespectprinciple.com. Best wishes for a grand day, week, year, and life! To those harmed and killed by people with low “Respect Levels,” the latest being the victims of a shooter in Las Vegas, my condolences for your pain and loss. Please know this … Connecting The Dots With The Respect Principle … was inspired by yours and other people’s pain, loss, and all the dark things people think and do to harm themselves as well as others … because they do not value … respect life … theirs or anyone else’s life. We can work together to bring more enlightened thinking to the world for the benefit of humanity … because everyone matters. Stand strong, be brave, and think … encourage … and do the right thing because you will feel better because of your efforts and not just the results your efforts might or might not reap. Remember evil flourishes when good people do nothing, so do what you can because every good belief, thought, and action adds to everyone’s’ good belief, thought, and actions … which has the power to create the needed changes for respect for all life. On behalf of all who need you to stand for them too, thank you. This idea of people connecting the dots with the respect principle is both a unifying concept yet also fosters the development of each person’s unique potential. Excerpt from the introductory speech/video about Connecting The Dots With The Respect Principle.